This section of the article may seem a bit foreign to you as we are not generally taught these concepts about our self or living. For this reason, keep an open mind as you read this material. Hold the possibility that what you read in this section is the truth that we have been missing and therefore why we experience dissatisfaction, discord and disharmony in our life. I suspect you will be much more tuned into the next section as that reflects much more of what we are familiar with albeit based on faulty beliefs and erroneous conditioning. You will notice the extreme contrast between the two sections. If we lived our life by natures laws and truths that govern everything in the universe, our life would unfold as easily, effortlessly and beautifully as a rose seed expresses a rose. The major difference of course is that a seed has a specific expression built into it where we get to be a co creator in how our life unfolds. That’s right; we have natural mental facilities as a human being that allows us to direct the quality of our life experience. In order to exercise this power as a co creator, we simply need to understand how it works. If life was based on the knowledge and understanding of our true power; who we really are, then after we were born, we would receive support and influence to help us identify, develop and follow our passions and interests and live in harmony with our true powerful nature. We would learn that we have unique gifts and talents and a purpose to use them and that we have the support of nature (through natural laws) for our success which includes continuous increase and expansion throughout our life. In fact we would come to know very early that we are born for success with a beautiful and natural unfolding (life experience) ahead of us just like that of a rose. This would lead us to be tuned into our natural desires and know that by using our natural powerful faculties of mind, in accordance with universal laws, we could draw those desires easily and effortlessly into our life. We would also know that what we have a desire to express is not only for our fulfillment, but it serves others to help them experience a fulfilling life. Essentially, we are serving each other in one way or another so that we all can experience a fulfilling life together, this is the underlying impulse of the universe. To illustrate this natural urge for self expression and expansion, look at the diagram below. As we move through life we have natural urges, interests and desires which are shown at the bottom of the diagram as the starting point. Of course the mere thought of these things do not cause them to instantly appear in our life, we must act to meet them which is shown in the diagram at the top as the end point. The enjoyment and success of our journey to living the life we desire is directly related to our effectiveness in using our mental faculties in conjunction with the laws and truths that govern the universe. Our faculties are choice, imagination, mental will, emotions, perspective and intuition. Choice allows us to think about what we want to think about and how we will think about it. Imagination allows us to hold a thought>image with an emotion regardless of “what is”. This produces a feeling. Our mental will enables us to hold that feeling. The feeling causes a vibration which draws our desire towards us. While our desire is moving towards us, as we stay in a high vibration, circumstances occur and we get inspiration to act and this moves us towards our desire. The larger part of our self is always receiving our desires and setting up the path to them. Realizing our desire is a combination of action and attraction. Sometimes our desire may seem like it just drops in completely out of the blue as one step, where other times there are several steps before we realize the desire. Whether you notice what is happening around you or not, there are many serendipitous occurrences that act as stepping stones for you to move towards your desire, this is the law of vibration at work, connecting you with all of the details that your source energy self has setup. Source is orchestrating everything necessary to make it happen and it can orchestrate things in ways that are beyond your wildest imagination. We simply need to maintain a high vibration to keep our frequency at the frequency level of our desires. When we are at that level, the path to our desire unfolds with inspired action. At this point you may be thinking, why is there a zig zag line between the starting point and the target. The reason is that the process to attaining the desire is filled with corrections. Who we are is perfect, what we do is not always perfect until we master it and even then we can have off days. Working towards something new will always entail learning new information and applying it. When we apply what we learn, we make mistakes, and that is a natural part of the learning process. It is natural that when we make a mistake we simply correct and carry on towards our desire. If another mistake occurs we do the same and continue in this fashion until we reach the target. You could say we are failing forward to put a positive spin on that word. Mistakes are a healthy and necessary element of moving to our desire. A mistake, when viewed constructively, prompts us to ask questions, and this causes us to gain awareness. With the new awareness we can make new choices. With new choices come new results and progress towards achieving our desires. To give further understanding to this concept of moving in a zig zag pattern to our desire; in the book Psycho Cybernetics by Maxwell Maltz, he talks about how a missile does not go straight to its target but follows a zig zag pattern. What happens with the missile is that it gets off course (makes a mistake in direction) then corrects, using its electronics, and gets back on course. This occurs, any number of times, until the missile gets to its target; a very effective process that achieves the end result. Maltz goes on to say that we simply and naturally follow this same pattern as we move to our goals; that is, just as the missile is off course (mistake in direction) and corrects, we too get off course (mistake in direction) and simply need to correct. As an example you can think of the Wright Brothers getting the first plane in the air. They had a strong purposeful vision with strong positive feelings about it. So they had set their target (in their imagination) and then started to act on it. This is the perfect recipe to generate a vibration that causes attraction. As they attracted “things” to them that helped them move to their vision, they acted on things to move towards their vision. Their progress though was not a straight path; they made mistakes, had errors and simply corrected them, held their focus on their vision and kept acting towards it. 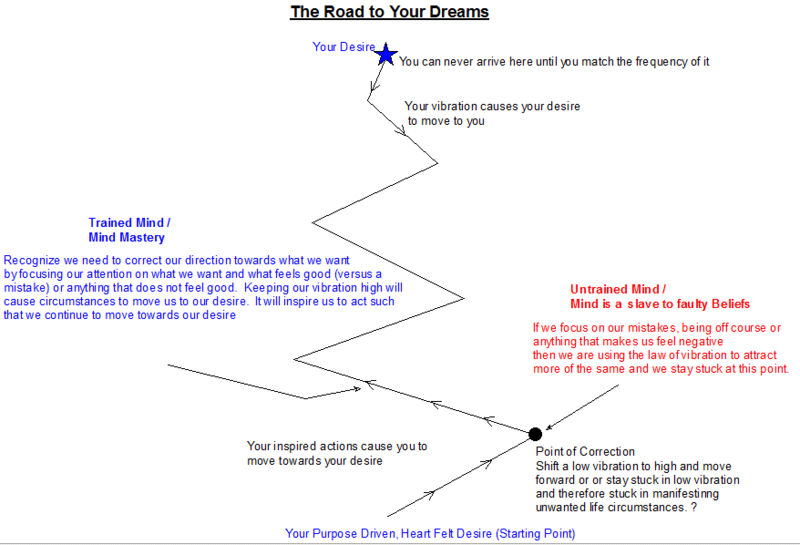 Can you see how using the law of attraction and personal action work together to bring us to the desire. Another great example of how having a desire and allowing yourself to make mistakes and correct to arrive at it is when we learn to walk. We fell forward, we fell backward, we fell down, we bumped into walls; we tripped but each time we got up and kept going until we mastered walking. It was no longer a goal, we mastered it, it now was something we used in our experience of life, but as we were in the learning process, we made many mistakes and followed that zig zag pattern to our target. We did not sit down and contemplate any negativity, we simply were determined to accomplish it and we did. Even after we mastered it, we still stumbled and tripped here and there but we realized it is ok, we didn’t focus on it and beat our self up, we just kept moving forward, without negativity, to accomplish whatever we were working on or to enjoy whatever we were doing. If we simply lived by and in accordance with our true nature and natural laws, life would flow along quite gently, peacefully, easily and effortlessly with complete fulfillment. Unfortunately the section you just read is not what happens after we are born. What happens is this, we start accumulating faulty, erroneous and limited beliefs about who we are and the way life is to be lived. This comes from the influences around us, and although the people around us did the best they could, they were missing the very critical information as indicated in what you just read in the previous section, and consequently so did we. As we grow up we really have no idea about the laws and truths so we don’t know our power, we don’t know how our conscious and subconscious minds work, we don’t know about the larger part of us, we don’t know that we are born for success, we don’t know that we have a natural purpose with gifts and talents, we don’t know that nature completely supports us and has our back, we don’t know that there is an endless abundance of everything and we have access to it, and that all we have to do is express our unique gifts and talents while living our purpose and serving others. Given that we don’t know this, essentially, we are living by the seat of our pants, running around virtually in the dark, feeling vulnerable, insecure and fearful of life to one degree or another. We do the best we can and some seem to do a little better than others but without the truth about who we are as a total human being no one can live a completely fulfilling life. The lack of fulfillment causes us to experience low vibration emotions and due to the law of vibration, we attract a variety of circumstances that are not what we want. Many people work hard to find their way out of this lack of fulfillment and unwanted circumstances but unfortunately for many they find no answer and accept conditions and circumstances as out of their control. When we accept things that do not feel good we pay a high price through the continued unwanted circumstances that come with a low vibration. We literally cannot hide, run from or mask our dissatisfactions and fears because the law of vibration simply won’t allow it – low vibrations attract equally low vibrations. Our life is not about what we want; it’s about what we vibrate and our circumstances and health very effectively reveal our vibration. Despite living in this state of lack, fear and dissatisfaction, our source self is always within and is constantly signalling us through natural urges and desires, and also through our intuition and emotions. The things that excite us and we feel passionate about, that is our inner being signalling us. The trouble is though, because of our faulty beliefs we either do not hear the signal or we are too afraid to act on it. Further, if we do act on it, we don’t know how to use our mental faculties, work with nature’s laws, nor understand the process of attraction and this causes us to get stalled on the journey to live the life we desire. What compounds all of this is that many have not discovered their natural and unique gifts and talents or they do not have the confidence to express them and therefore spend their time doing the things that they are half hearted about at best instead of spending their time doing the thing they love. Because of our faulty beliefs, what we go after in life tends to be more about something that we believe will secure our future, related to money, what someone else wants us to do or some other reason that is not based on our true self, purpose and passion. This means we have aspirations that are in disharmony with who we really are. So from the start we tend to be on a path that is unpleasant, and it continues to be unpleasant proportionate to how far it is away from our natural path and our natural high vibration. Since we do not understand the truth of who we are, instead of seeking alignment with our passions as a way to bring satisfaction and fulfillment into our life experience, we tend to look outside of our self to find “things” that will fill the void. This is where life seems to be a mystery because no matter what we do on the outside it does not fill us up. There is only one way to feel filled up and that is to get into alignment with who you really are, your desires, and allow yourself to follow your natural path of expression. Now that you understand why our lack of knowledge about our self and our relationship to the universe interferes with our natural unfolding, let’s take a look at the diagram below again to see how it illustrates this. Keep in mind, there are two ways that faulty beliefs keep you away from the life you want, 1) they simply keep you away from your natural purpose and passions and 2) they can get in your way when you are following the path of your purpose and passion and make it virtually impossible for you to be successful. What I am explaining in the diagram is scenario number 2, that is, you are on your natural path, but you are not achieving the satisfaction you desire. With regard to scenario number one, if we are spending our days doing things that are not in line with our purpose and passion, we are not on our natural path at all, we are simply off course from our true nature and therefore out of alignment. The first step in that case is to identify with who you are, what you really want, and why you want it. What is it that makes you feel really good? Once you do that and start moving towards it, then you need to be aware of how your faulty beliefs can sabotage your progress towards living the life you are satisfied with. That is what we are going to cover here. 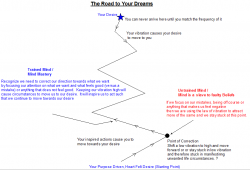 As you can see from the diagram and what was explained in the first section of this article, progress towards living the life you desire will come with mistakes along the journey. Mistakes are part of the natural order of learning and advancing. With this in mind, for many, achieving a dream life is virtually impossible because there is such a fear of making a mistake, of being wrong, of letting someone down, of looking stupid, of being left out or left behind, of being a failure, of being a “bad” person, or of not being able to look after our self. So if we look at the diagram, we are stalled on the path before the first correction point because we will not allow our self to make a mistake. There may be ways to avoid having others see your mistakes but you will have to work so hard to achieve that, that the low vibration emotions from the stress are going to really impact your life in a very negative way. Even if you succeed in reaching the objective it will come at a very high price, one that ultimately will almost certainly derail any long term success and the journey will endure a great deal of unpleasantness from broken relationships, losses of one type or another, health matters etc. It has to because when we are driven by the fear family, the low vibrations have to attract their equal. It’s like we are always working so hard to keep our head above the water. In the case of a person who is a perfectionist, you can see that any achievement would be a stress filled low vibration journey. Rather than accepting a mistake as positive part of growing and learning, we avoid taking ownership, we may blame others for our predicament or we engage in negative self talk about how we could have or should have done it differently. We keep our focus on the mistake and therefore cause it to recur and we simply stay stuck in the repeating pattern of the mistake. And because we don’t understand the law of attraction, we can’t understand why we stay stuck, why people keep acting the same way towards us, why circumstances seem to conspire against us. But no such thing is happening, all of those things are simply telling us about the vibration that we are sending out, which is the low vibration around our feelings of making a mistake. The only way to progress past the mistake is to accept it, be ok with it and learn from it; holding positive energy about the learning aspect of the mistake, the opportunity to advance your life. Isn’t it odd that the very tool that nature gave us to help us move forward, we use it against our self to block our self from moving forward! Unfortunately what can happen once we realize there is no way to progress through the mistake is that we give up on our dreams and live a mediocre and status quo life. The laws of nature however will not permit that as we are creative beings programmed for expression and increase. So as we attempt to hold our self static, our low vibrations accumulate and that’s when health matters and more negative type circumstances start showing up. If you think about this in terms of the missile example previously, it would be like programming the electronics such that if the missile was off course, it would abort and become motionless on the spot instead of correcting and continuing on, does that make any sense what so ever. Can you see how we have been programmed against our very nature to succeed? With this understanding you can now start to make mistakes your friend instead of your enemy and start taking steps to return to your true nature, living the life of fulfillment you were intended to. It is critical for you to realize that when your health starts to be impacted, there is nothing wrong with you, it is your alarm going off telling you its time to change, to get back into alignment with who you really are. When the alarm sounds you can be sure you are off course from your true nature and there is only one way to effectively shut off that alarm – get back on course. Drugs, surgery or any therapies or quick fixes that suppress the alarm are only going to make matters worse unless they are used in a sense for temporary relief while the root of the issue is addressed. If you do have a vibrational shift, a wake up call so to speak, because of a health trauma then your life will change and the alarm will go off (depending on the shift). But know this, it was not the drugs, surgery or therapy, it was the vibrational shift within you that caused the change. What I mean by this is perhaps a health issue scared you so profoundly that you decided to see life in a different way, perhaps your level of gratitude for the small things became more acute. That would be a definite vibration change and your life would change along with it. Although external remedies can be a catalyst for a return to health, without understanding the root reason for a change in your health, you are still at risk of experiencing further health matters. To be clear, if you allow yourself to hold on to low vibration emotions you are risking misalignment and that is when health matters will make their presence as a way to let you know that you are indeed out of alignment. Again, you may unintentionally gain realignment through external remedies but the best long term solution is intentional realignment. Now you can see why understanding your true self and purpose along with the laws of nature is vital to you experiencing a life of fulfillment. You need this knowledge to travel your true and natural path, to allow your true and natural unfolding. You need this knowledge to intentionally experience health, happiness, harmony and abundance over a life time.